Deshaun Watson showed up in a black tuxedo for his first NFL start. From his snazzy bowtie to his game-turning scramble, he did it all his style. 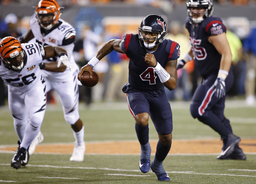 The rookie ran 49 yards for a touchdown and led the Houston Texans' depleted offense to a late clinching field goal in a 13-9 victory over the Cincinnati Bengals on Thursday night. "I was just trying to make a play, I found a hole and broke away," he said. Watson showed up in a black tuxedo - it was his 22nd birthday, no less - and showed the flash that helped him lead Clemson to a national title last season. He avoided the rush and ran 49 yards for a 10-3 lead late in the first half, dashing past befuddled defenders. "The first start on my birthday was pretty emotional," said Watson, wearing a Texans T-shirt to his postgame media availability. The Texans (1-1) got the most out of their depleted offense, and then let their defense do the rest. The Bengals (0-2) have failed to score a touchdown in their two games to open a season for the first time in their 50 seasons. The Bengals are the first team since the 1939 Eagles to open a season with two home games and fail to get in the end zone, according to information from the Elias Sports Bureau shared by ESPN. "I am shocked," coach Marvin Lewis said. Watson led a 13-play drive that set up Ka'imi Fairbairn's 42-yard field goal with 1:56 left. The Bengals got the ball, but turned it over near midfield on a fourth-down completion. After a punt, they ran one more play with 2 seconds left that didn't get far. Cincinnati lost to the Ravens 20-0 at Paul Brown Stadium on Sunday, the first time in their history that they opened the season blanked at home. Andy Dalton threw four interceptions and lost a fumble. The Bengals managed only three field goals by Randy Bullock on Thursday. Dalton fell to 1-6 career against the Texans, including a pair of playoff losses. He was 20 of 35 for 224 yards with three sacks. "Very surprised," receiver A.J. Green said. "We practice well, but when it comes to the game, we're out of character. I don't know what we're doing out there." Watson directed an offense missing three tight ends because of concussions, along with receiver Will Fuller Vand guard Jeff Allen. The Texans kept it simple, and Watson avoided the game-turning mistake despite heavy pressure from the Bengals. Watson was 15 of 24 for 125 yards with three sacks and no interceptions. He ran five times for 67 yards. Watson became the first rookie quarterback to win his first start on the road in a prime-time game since the Eagles' Joe Webb in 2010, according to Elias. The Bengals became the first team that opened the season with five scoreless quarters since the 2009 Rams, who went 1-15. They thought they finally had a touchdown when Tyler Eifert caught a pass from Dalton in the end zone in the third quarter - the videoboard broke into a touchdown song - but the tight end had stepped out of bounds before making the catch, nullifying it. Cincinnati settled for its third field goal. Texans CB Kareem Jackson got his first career sack. ... Watson's TD came on the longest run by a Texan since Arian Foster had a 51-yard run against the Jaguars in 2014. ... The Bengals went 76 minutes, 16 seconds before getting Bullock's field goal for their first points of the season. On the final play with multiple laterals, Dalton got the ball back and threw it to center Russell Bodine, who was leveled by J.J. Watt to end the game. "Zig-zag, zig-zag, zig-zag, tired, tired, tired," Watt said, describing the multi-lateral play. "Thank you for throwing it to the guy closest to me - body slam." WATT'S RETURN: That wasn't Watt's only emphatic play as he got back in form. He returned from a back injury that wiped out most of his 2016 season and managed only one tackle and one quarterback hit during an opening 29-7 loss to the Jaguars. On Thursday, he had six tackles, knocked down one pass and hit Dalton once. Watson and Bengals rookie running back Joe Mixon exchanged jerseys on the field after the game. The Texans lost two cornerbacks. Johnathan Joseph hurt his right shoulder while making a tackle in the first half and didn't return. Kevin Johnson hurt his left knee in the third quarter and was out. The Texans already were missing LB Brian Cushing. He's in the NFL's concussion protocol and has been suspended 10 games for violating the NFL's policy on performance-enhancing substances. Bengals: CB Adam "Pacman" Jones returned from his one-game NFL suspension for an offseason conviction and hurt his right elbow in the fourth quarter, but returned and finished the game. The Texans play at New England. They're 1-8 against the Patriots, including a 34-16 playoff loss last season. The Bengals play at Green Bay for the first time since 2009. They've won three straight against the Packers, two of them at Paul Brown Stadium.